Novel test for the appraisal of the ability to measure speed and movement in space. This ability is especially relevant in traffic psychology. Estimate of speed and movement of objects in space. Main areas of application: Traffic psychology, aviation psychology, and health psychology (especially sport psychology). A function that is very important in traffic psychology is the extent to which a person can get the feel of a movement and can correctly estimate the movement of objects in space. The experiment of moving objects in certain trajectories while executing an eye-movement analysis was abandoned due to experiences with eyemovement analyses. A green slowly-moving ball can be seen on the screen. Then at an unknown point it disappears and two red lines are displayed instead. One of the lines is situated at the point where the green ball disappeared. The other line is the goal. To measure time anticipation, the respondent presses a button in the moment when he / she thinks that the ball should have reached the second line. To measure movement anticipation, the respondent is additionally asked to indicate the position where the ball will have reappeared. This is done by means of two keys that control an arrow on the screen. The respondent receives feedback only during the instruction phase. This includes both on the ball's prospective trajectory as well as on where the ball was located at the time he / she pressed the button. In the test phase, this feedback is no longer issued. The difficulty of the task is varied as follows: First the ball's movements are simple and linear. Then they are curved and linear. Next the movements are constant sine-waves that later on become modulated as regards amplitude, frequency, and a combination of amplitude and frequency. There is a long form (S1) with 48 items, a short form (S2) with 12 ems, a linear form (S3) with 8 items, and a linear form for time estimation only (S4) with 30 items. Time anticipation: The time error is registered as time difference in hundredth of seconds. 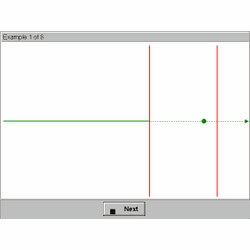 Motion anticipation: The position error is registered as deviation from the correct position, in pixels. This value is calculated only in test forms S1 to S3. Reliabilities (internal consistency) obtained for the long form, particularly for anticipation of time, are very high, ranging from r=0.92 to r=0.98. Reliabilities (internal consistency) for anticipation of movement in the long form are as follows: Median direction deviation overall r=0.76, Median direction deviation for linear path r=0.69, Median direction deviation for complex path r=0.72, Median direction deviation for sinusoidal path r=0.62. Validity studies are currently available for a precursor version of the test. The results of an evaluation study involving a driving test show that in real-life traffic situations the overestimation of distance causes more problems than underestimation of distance. Norm samples varying in size between N=271 are N=433 are available for all forms of the test; some norms are also available separated by age and gender. Between 5 and 25 minutes (including instruction and practice phase), depending on test form. Appraises of the ability to measure speed and movement in space. This ability is especially relevant in traffic psychology.